On Tuesdays we are thrilled to fling open the doors to all of YOU! We love hearing your dreaming stories…the lessons you’ve learned, the roads you’ve walked, the dreams He’s planted in your hearts! Today we are so excited to welcome back Gretchen Saffles to this space…she shares the important reminder that dreams take time to grow. Thanks for being here again today, Gretchen! Welcome back to part two of Gretchen’s story. If you missed the post last week you can start here! I had no idea when I was moving to Tennessee that I would meet the man I would marry at middle school camp. I didn’t know I would work full-time at that church. I didn’t know that the job I had, though very demanding and rewarding at the same time, would equip me to own my own small business and create journals. I didn’t know any of that, and had I known, I know I would have complained and worried less and lived more fully in the moment. Each twist and turn on the journey has served a purpose in some way. God is glorified in making windy roads lead to a path that makes much of Jesus. It is unexpected and can’t be controlled. It is wild and crazy and risky. It is also soul-scrubbing and faith-testing. But overall, it is worth it. There is no exact formula to follow other than the one Jesus told us in Luke 9:23 – “And he said to all, “If anyone would come after me, let him deny himself and take up his cross daily and follow me.” The beginning of a dream that lasts forever is a death to the things that don’t matter. We have to die to ourselves, die to our sin, and die to this world so we might truly live and follow Jesus! If you are desperately seeking to pursue a dream and not just leave it in a journal, remember that the first place to start is in following Jesus. As simple, yet life-changing, as that! The problem with us as dreamers is that we want things to happen fast. We are a fast-paced society accustomed to instant gratification. However, this is not the way God works. ALL throughout Scripture, we read of people who waited years and years for promises to be fulfilled. And, get this, some of them never saw the promise fulfilled on earth! Abraham was promised descendants numbering the stars, but Hebrews 11:13 that he never attained the promise on earth. But he did get so many greater things from God! Don’t be discouraged when the fulfillment of a dream happens slowly. Good, lasting things take time and each step, however small, is important. The largest trees in the world are the sequoia. With a diameter ranging to 25 feet and a height of about 275 feet, these towering trees seem insurmountable. And yet, they all began as a tiny seed. Not only that, but they take months for the seed to germinate and years upon years to grow into the giant trees that we know of! Our dreams are just like these trees. They begin as a tiny seed that God sows into our hearts. He waters them, they take time to grow, and in the end, they reach high to the heavens and praise the One who created them, sustained them, and made them. I pray that you would know that wherever you are in your dreams, whatever situation you are currently in, and whichever way you are currently going, that God is at work. I’ve still got a lot of dreams in my journals. New ones, fresh ones, raw ones. They are aching to be out of the notebook, but I am also in a season of waiting on the Lord and following Him as I pursue these. Dreaming never stops. Once you reach one point, God plants another seed. He is always birthing a new idea for Him in our hearts. My advice to you as we all follow Jesus and dream big dreams would be this: embrace the waiting and watering seasons, and expect great things from our great God. You were created to live abundantly, it’s time we followed Jesus in that pursuit. He is worth every ounce of energy we’ve got and He will do greater things that we could ever imagine. Let that seed grow and keep your eyes on the One who planted it there in the first place. 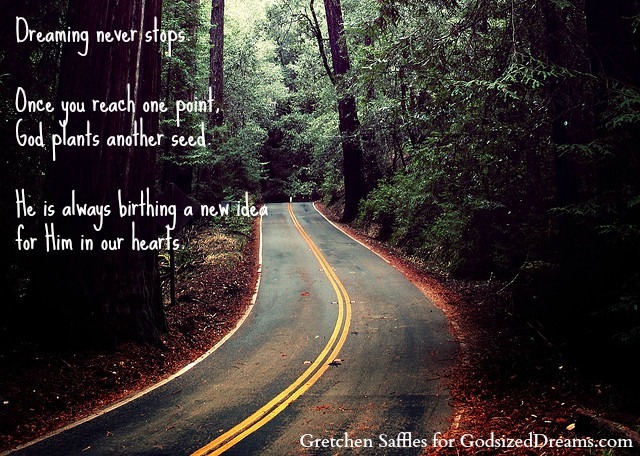 Gretchen Saffles is a follower of Jesus and lover of His creation. She is married to her best friend, Greg, and they live in the beautiful Knoxville, Tennessee. They are expecting their first child coming this May! 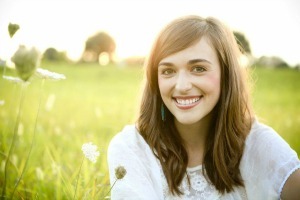 She is a firm believer in God-sized love stories that magnify the glory of Christ and the church. Her passion in life is to teach women that they weren’t meant to live mediocre, mundane lives centered around themselves. They were meant to live for the glory of the Gospel of Jesus Christ that fills us up to overflow onto the world around us. She owns Life Lived Beautifully, a business/ministry created to inspire women to share the Gospel through a life lived for God’s glory. She has four main roles in the business: creator/shop owner/blogger, personal stylist, speaker, and BIG dreamer. On a daily basis, you find her drinking coffee, adventuring with her husband, dreaming new dreams, and seeking to make much of Jesus through every opportunity God gives! You can find Gretchen over at Life Live Beautifully, connect with her on Facebook, Twitter and Instagram. And you can purchase her beautiful products here! Beautiful and encouraging post!! I am learning to grab hold of all the moments. My favorite quiet time is when I can curl up in my chair with a hot cup of tea and my Bible before anyone gets up. I get to see the sun come up and start the day with my Father. this was precious. I loved the sweet reminders. Especially after my weekend away with the Coming Alive Board of Directors. Coming Alive Ministries was started as a dream in 2012 and God continues to teach me so much on this adventure. It was really precious to me when I recognized that we had the planning retreat in a cabin that 10 years before I had planned and executed my first girls retreat. Gods timing :0) Thanks for the post!